Acupressure is a natural treatment that can be used as part of a protocol for almost any medical condition within the horse. 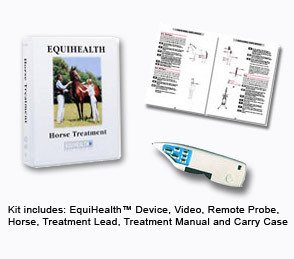 EquiHealth™ is our equine equivalent of our human HealthPoint system. It is a complete kit that enables you to safely and effectively treat your horse through our world-renowned acupressure location and stimulation system. EquiHealth™ is effective on a wide range of equine ailments. It can be used safely by anyone – with or without veterinary training. *As with any medical device, you should always seek the advice of a qualified Veterinary Surgeon to ensure a correct diagnosis before you begin any home treatment on your animal. Using the same principles and theories of our popular and effective HealthPoint system, EquiHealth™ acupressure is an excellent tool for enhancing the health of your horse. EquiHealth™ uses the same acupressure points and meridians as acupuncture to achieve the desired health benefits, but without the need for any invasive procedures. This means that even nervous horses can be treated, at home, by you, with complete ease. 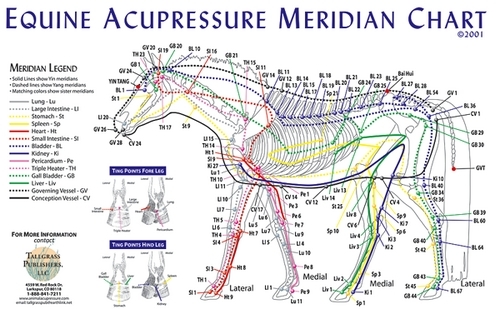 Using acupressure points found along the 12 major meridians, you can use the EquiHealth™ instruction manual to balance your horse’s physical and emotional states, concentrating on accessing various acupressure points along the meridians close to the surface of your horse’s skin. It has a valuable role as a preventative treatment too. For example, where horses are involved in competitive events, and are therefore prone to developing injuries that may often go unnoticed until they advance to more serious conditions, or develop complications. Regular preventative treatment throughout a competition season may allow you to catch minor injuries at an early stage. By using EquiHealth™ in this way, to help restore normal blood supply and function to the muscles, your horse may heal much more rapidly, and be able to compete normally. In practice, EquiHealth™ acupressure has been used for the relief of many musculoskeletal issues, as well as to influence normal organ and systemic functions and help prevent premature disease or disability. Below are some of these areas in more detail, along with other ailment categories that have significant value in the use of our innovative EquiHealth™.